Protect lives and property with state-of-the-art guidance on conducting safe, thorough, accurate inspections! 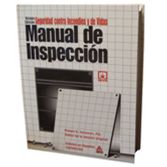 The 2002 Spanish edition of the Fire and Life Safety Inspection Manual is your step-by-step guide through the complete fire inspection process, with special emphasis on life safety considerations. Formerly the NFPA® Inspection Manual, it covers the full range of hazards and gives you solid advice on identifying and correcting problems. Easy-to-follow checklists help you remember and record every important detail. Early chapters provide important background information, while the second half presents inspection guidelines for specific fire protection systems and occupancies that are based on the Life Safety Code®. Expanded with updated facts and new chapters! 150 illustrations, more sample forms, plus a larger format--make this acclaimed Manual more helpful than ever. Perfect for use in the field, the Manual features a new 8½" x 11" size with full-page checklists at the back of the book linked to individual chapters. Detailed visuals throughout help you understand complicated concepts.